Aloha bro bro. This blog entry is going to be the last of my Hawaiian themed posts, so I will stop talking about Tom Selleck and Kenny Powers ("mahalo, you surfers") for at least a few months. Ok, more like until my next trip to Hawaii or if my husband dresses up as Tom for Halloween, whichever comes first. For years I have been trying to convince him to dress as Buddy the Elf, but for some reason he isn't into that idea???? Not sure why because he would look like a total badass. 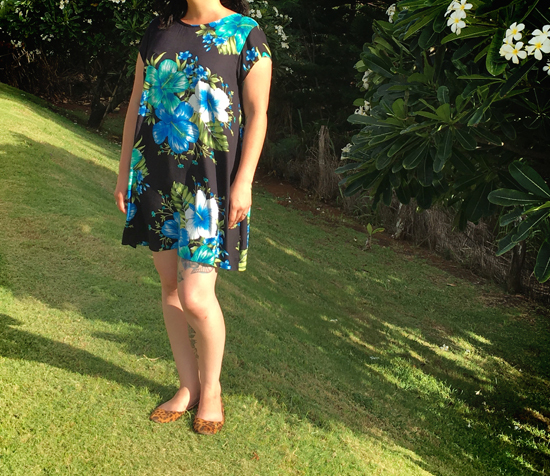 Anyways, today I introduce you to Seamwork Kenedy, a dress in fabric that would make the cast of Magnum PI v v proud. 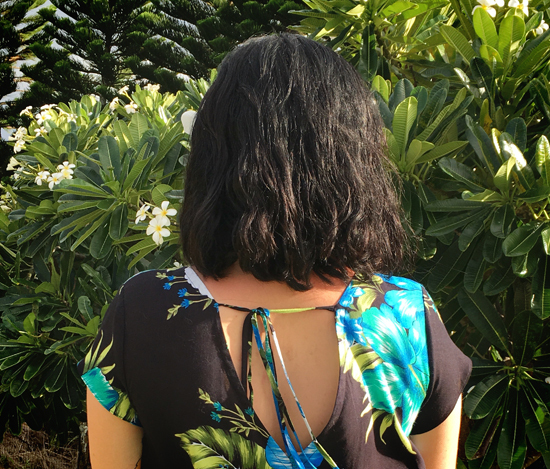 Kenedy was a breeze to sew with straightforward directions and only a few pattern pieces, but the back is where the party is at! Check out that v-neckline, I'm into it! The idea of dealing with bra straps showing and the scarring on my back being visible made me hesitate, but I am really glad I sewed the pattern because I LOVE the fit, the look, the fact that my bra straps didn't end up showing, and who cares what my back looks like anyway? Life is too short to worry about what people think about my back or my run on sentences. You can quote me on that one hahaha. Pattern was sewn as is, with no alterations other than lengthening the sleeves an inch. 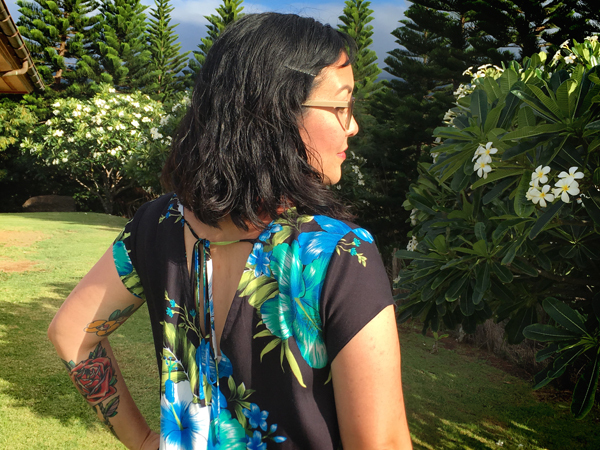 Cap sleeves are not my jam, so if you think my sleeves look weird you can blame me and not the pattern. I'm into how they turned out though. The hem of the sleeves and bottom hem of the dress were finished with a rolled hem, a technique I have not been successful with in the past. You can bet that I practiced on a lot of scraps before committing to my final fabric. I give my sleeve hem a thumbs up and my bottom hem a thumbs sideways. In short spurts I seem to be able to get the rolled hem foot going alright, but the longer the fabric the more room for me to mess up. The end result was pretty decent, but I would like to give it another shot to try and master it. It's worth the effort, rolled hems look so pretty. 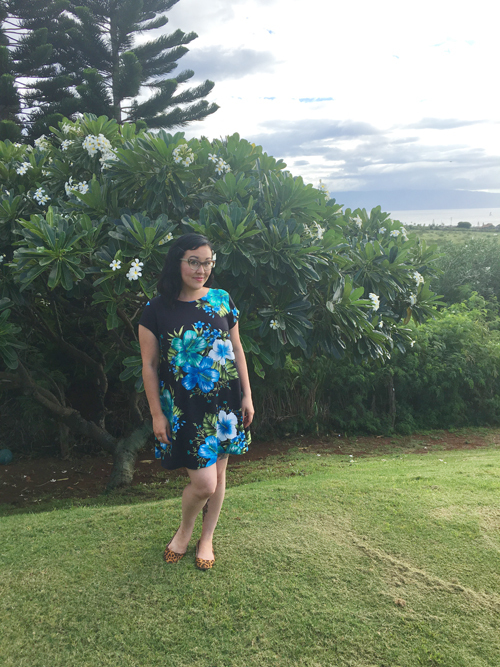 Oh, the only thing I would change for my next non Hawaiian version would be to add some length to the bottom. Man, I am a shorty and this dress is short! 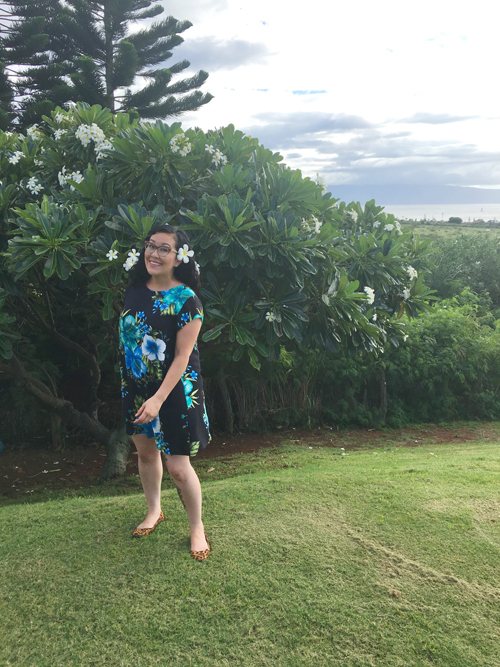 The fabric for this dress was purchased online from Hawaii Fabric Mart before my trip. I am a giant fan of rayon and this only costed $3.99 a yard (five yard minimum). So, for $20 I got five yards, didn't use it all, and have at least two yards left for another project. Yeahhhh! The quality is good, it feels nice, and didn't bleed in the wash. I'm impressed, will buy again, power seller, A+++, fast shipping, blah blah blah.